This collection of New Year's Flyer Templates makes it easy to announce your festive new year events for your restaurant. Start the year off right and celebrate the new year with your valued customers. 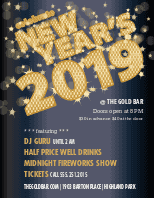 Our New Year's Eve flyer templates can be easily customized online, printed, and published online to share with your customers.